Bohemian interiors are a mix and match for everything and anything. It is full of texture, patterns, lines and beautiful contrasts. It could be a combination of shabby-chic and traditional or it could be an eclectic style with a touch of rustic. It could be full of strikingly bold hues or clean lines and minimalist colors. The heart of this style is artistic touches and the story of every travel and adventure. The good news is, it is not confined to a strict rule. In Bohemian interiors, there are no rules. It is all about reflecting one’s peculiarity, style, passion, and lifestyle. It is all about freedom. 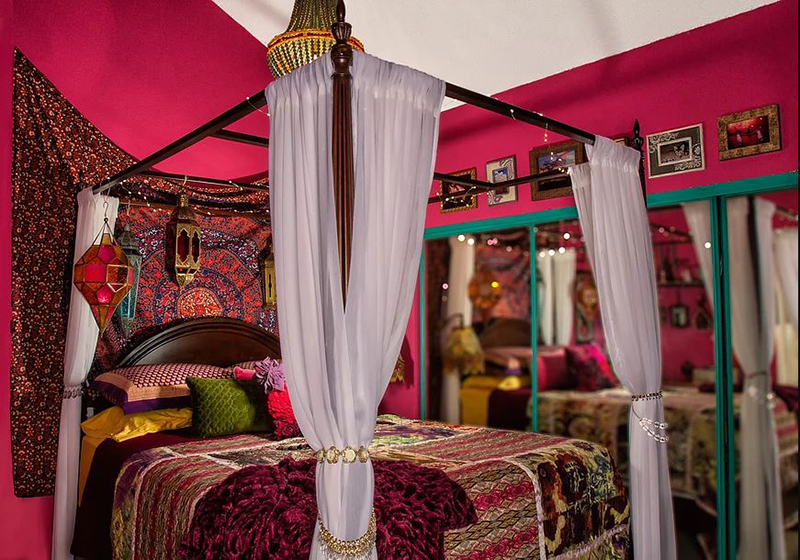 Below is a list of 20 Whimsical Bohemian Bedroom Ideas that are sure to inspire the gypsy inside you. It will show you how this unconventional style looks beautiful when put-together. It showcases intricate details of artworks, exuberant colors, contrasts, lavish textures, and patterns. You will sure to love the earth elements, mostly the lovely greens, put equilibrium to the whole equation. Scroll down and take a look at every photo closely and let me know which one ignited the bohemian spirit in you. Bohemian style expresses individuality and it does not conform to any structure and order. The pattern-on-pattern you see on the widespread and toile wall accent complements the whole scheme with its contrasts of colors both soft and bold. The addition of wood in its vintage and shabby-chic glory gives the balance to the room. 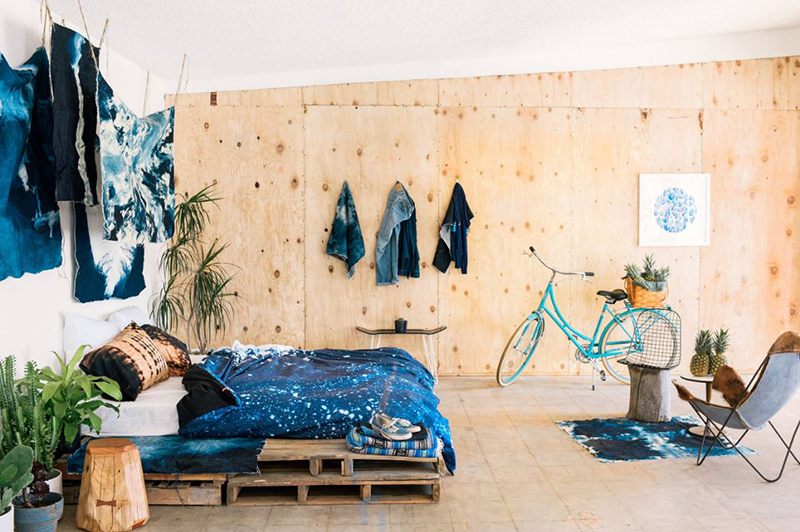 This monochromatic room used indigo as the color to highlight and brown or wood (earth colors) as a backdrop. These beautifully done hanging tie-dyed fabrics grab the spotlight adding character and eccentricity to it. This room is so dreamy and whimsy. The layers of white fabrics, from the hanging sheer that makes the bed more intimate and cozy to the bedspread extending to the floor. It all works together to create a room full of personality with a lot of feminine flairs. 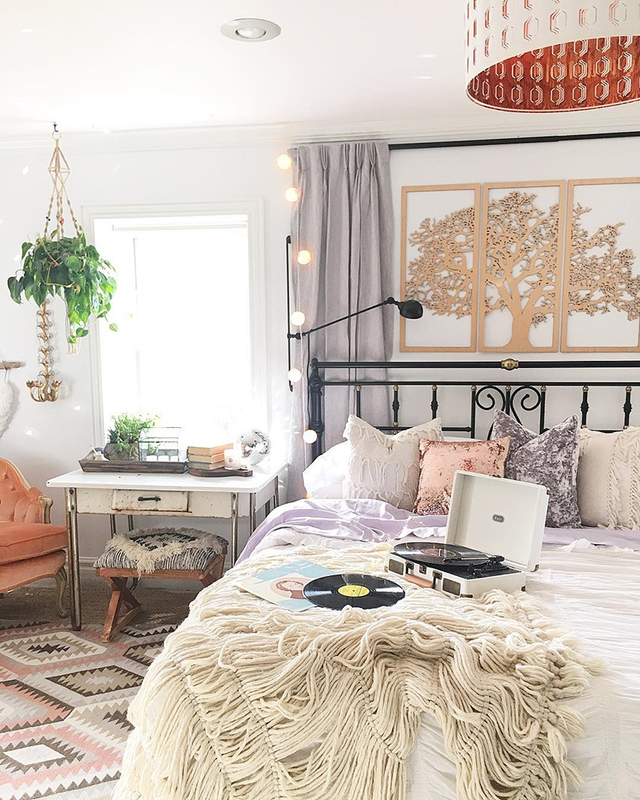 If you would like to have a cozy and lovely Bohemian bedroom, choose fabrics that you can layer together that will add depth and drama to your interiors like this one. This serene room is full of sophistication with its lovely texture and colors. I love the hanging green and the hints of brass decor bringing a glamorous touch to this bohemian lair. The knitted throw blanket and beautiful throw pillows add texture and accent. Take hints from the places you have been to or the place you are dreaming to go to and start from there. The bohemian interior is about adventure and travels like the one above. There is no wrong decor or colors in this kind of style. All you need is to know yourself and the things that define who you are. This is one lovely bedroom I would love to have during my younger, single years. I am drawn to the hanging owl fabric decor and its beautiful colors. 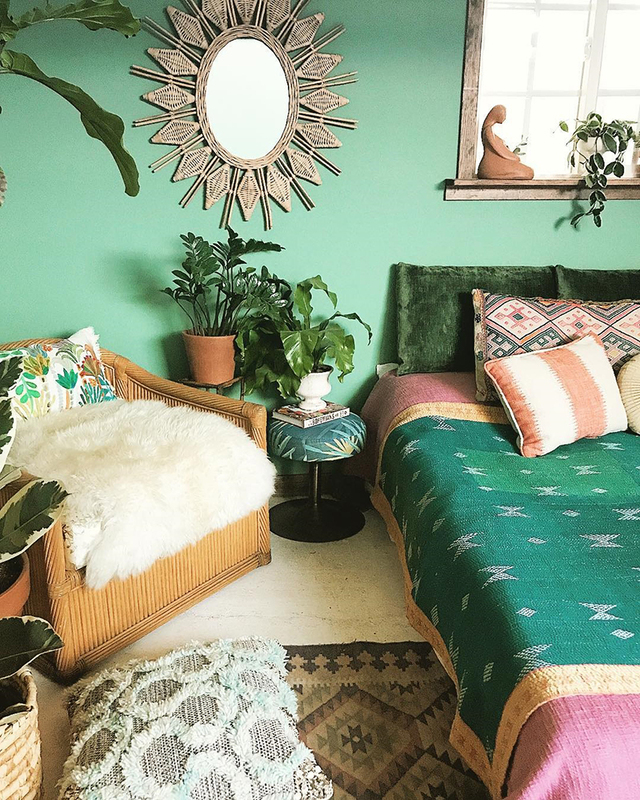 The teal accent makes it fun and patterns on the bedspread and wall decor make it anything but boring. I love the mural on the focal wall! 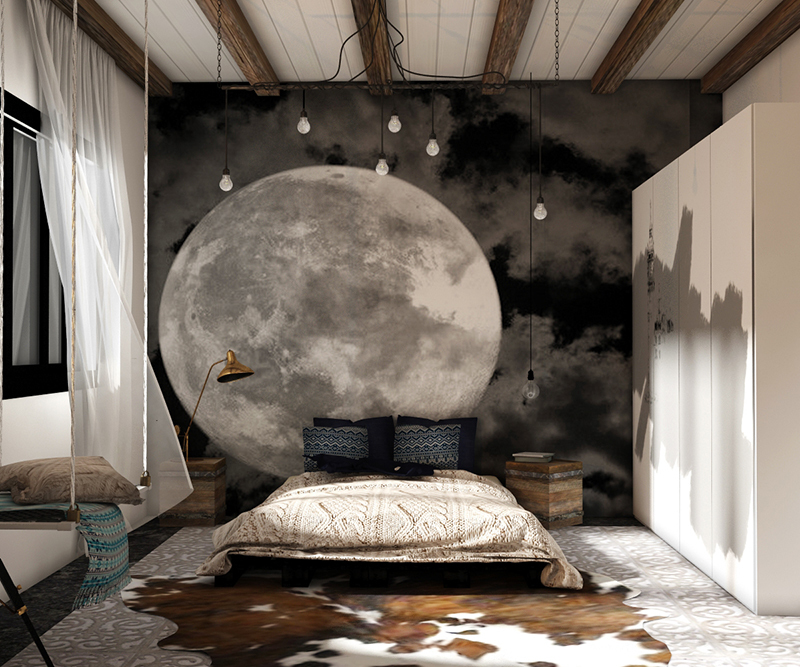 The moon on a dark night sky adds drama and character to the room. The hanging light bulbs in different heights create depth while exposed woods on the ceiling and the wood accents add texture and calming effect to the room. 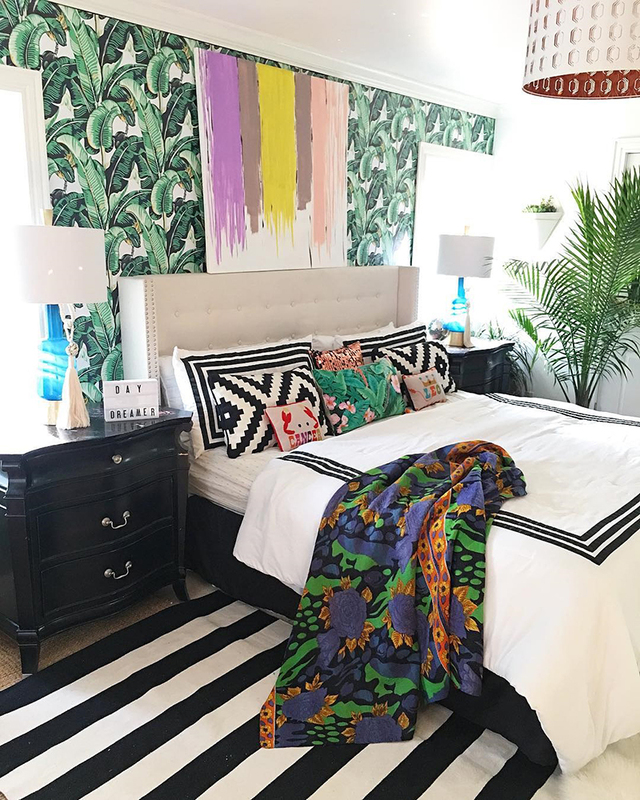 This bohemian bedroom design has lovely lines and patterns. The geometric lines create a beautiful contrast to the floral and leafy patterns. This bedroom feels so chic and serene. The map on the accent wall exudes a traveler’s heart who longs for adventure and freedom. I love how the wooden ladder and the rest of the decor made it more appealing and interesting. Check out are other ways to use a map for your bedroom’s decor. I have always been a fan of anything wicker or rattan-made. There is something about its indigenousness that makes it stand out. 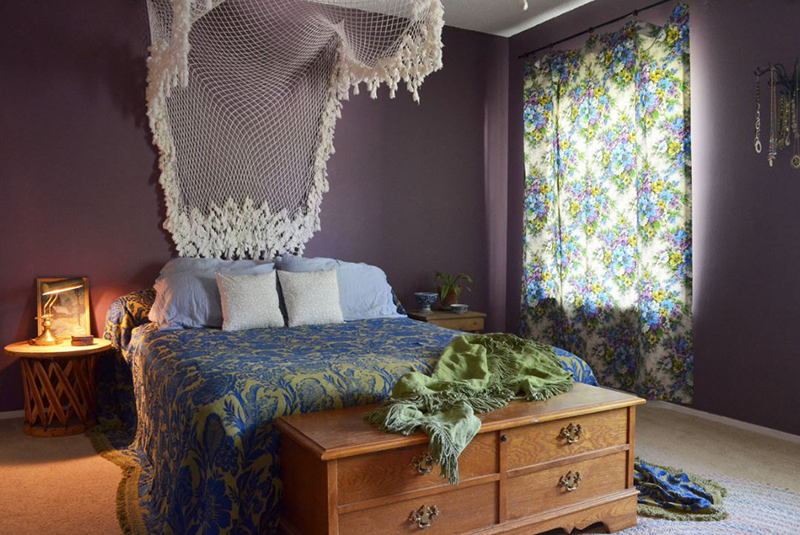 In this bohemian-chic bedroom, the lovely patterns and contrasts of colors make it very beautiful and so serene. I love how the plants elevate the room with its mix and match of sophistication and simplicity. Be adventurous with colors, textures, and patterns. 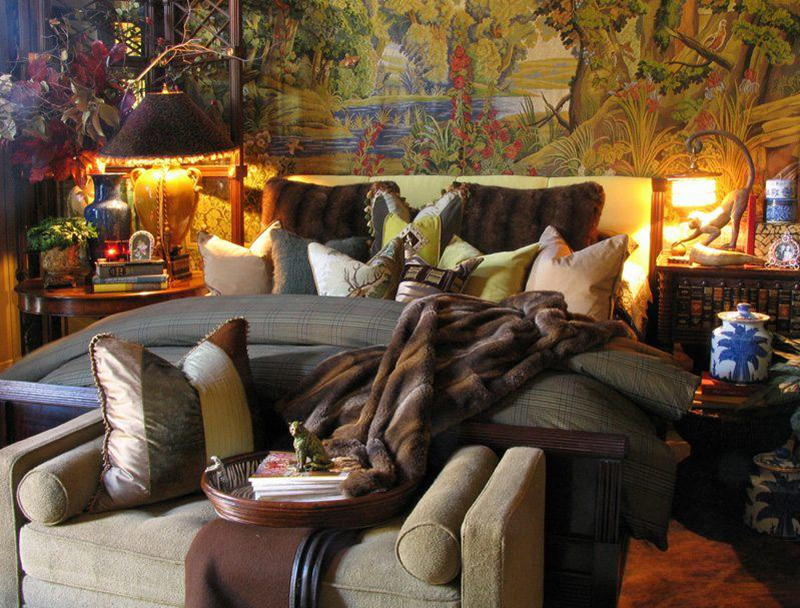 In this stunning, exotic room, bold hues and incredibly beautiful different patterns dominate the scheme. Filigree lanterns are a great addition that creates a big impact when it comes to cozy lighting and charming ornamentation. 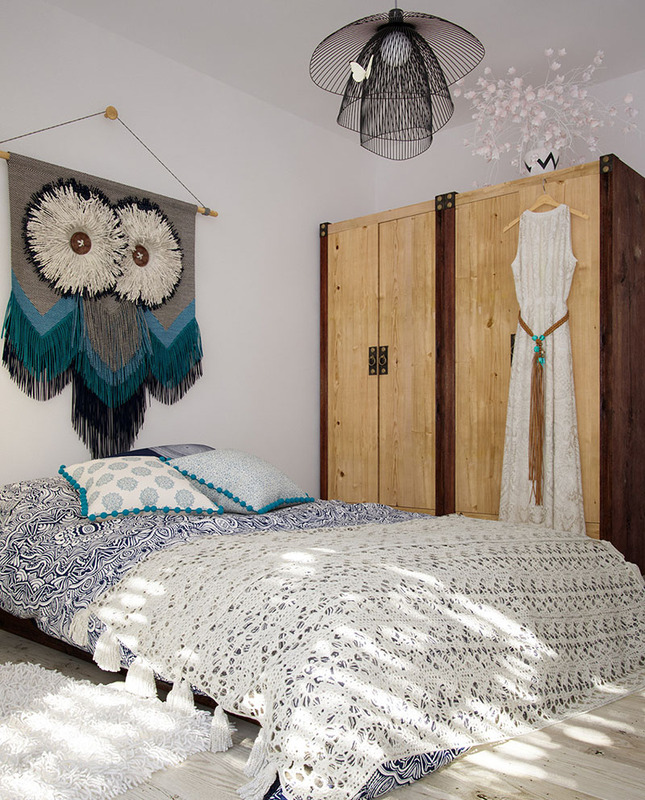 This is one adorable nature-inspired Bohemian bedroom design. The sticks accent was from the hikes the owners have done. 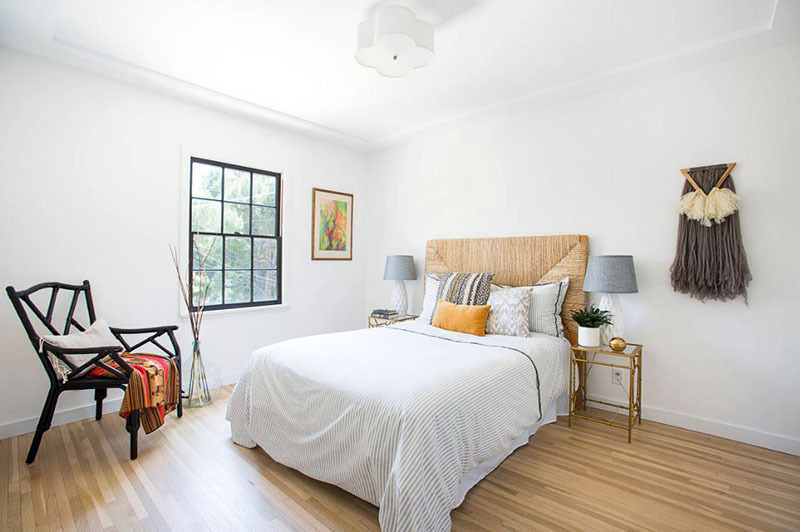 Beautiful clean lines and unexpected elements make this bedroom fun and so much inviting. 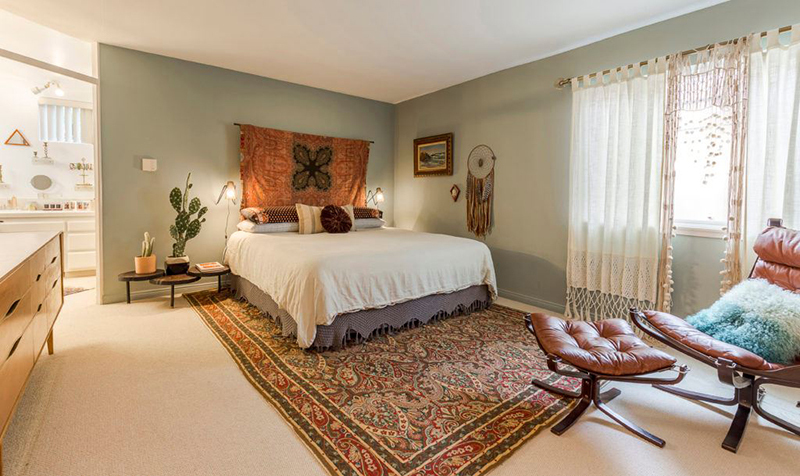 Choose an intriguing carpet to accentuate your bed and add character to it like the one on this lovely bedroom design. 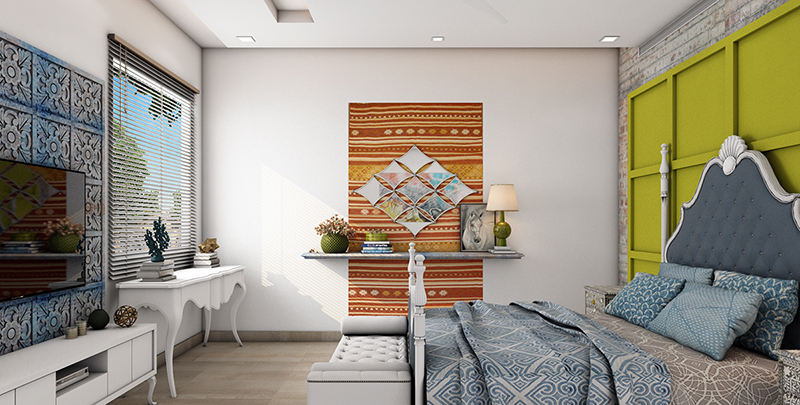 Hang that beautifully made dream-catcher and other artwork to instantly spice up an empty space on your walls. 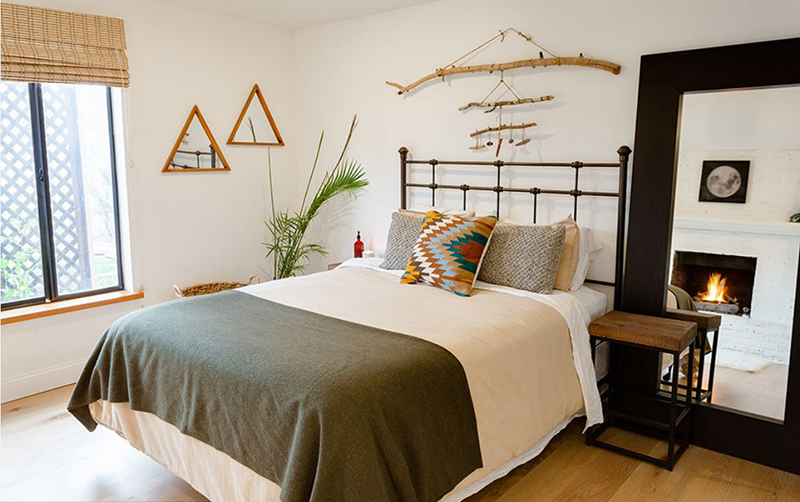 This bedroom gives off a modern, bohemian vibe. The lovely colors coming from the throw pillows and ottoman playfully accentuate the bedroom. The brass pendant light adds sophistication and the faux fur carpet creates a glam look. 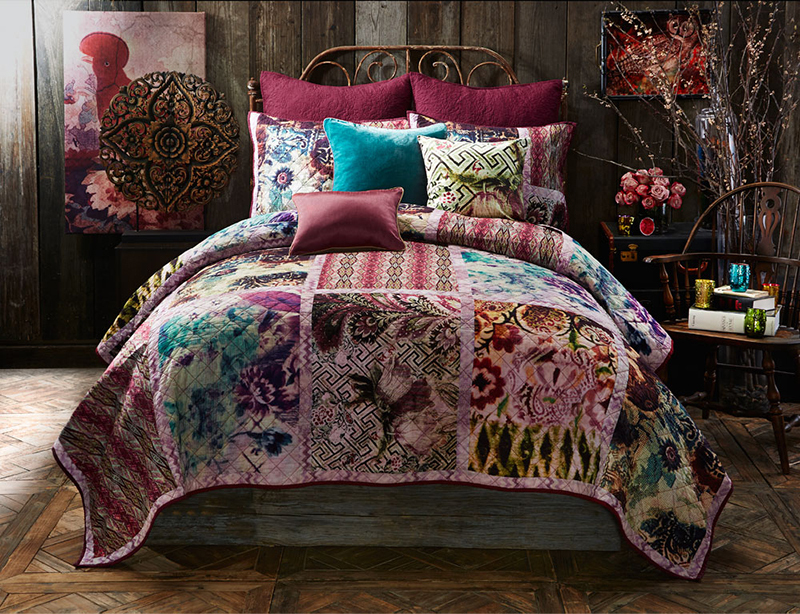 This beautiful bedroom could not get any more bohemian than what it is. The unexpected color scheme used to come together wonderfully. It looks so inviting and diverse. I love everything in this room! The wood wall makes it easy for these lovely decors to stand out on its own. The whimsical bedding chimed perfectly with the artworks and ornamentation. 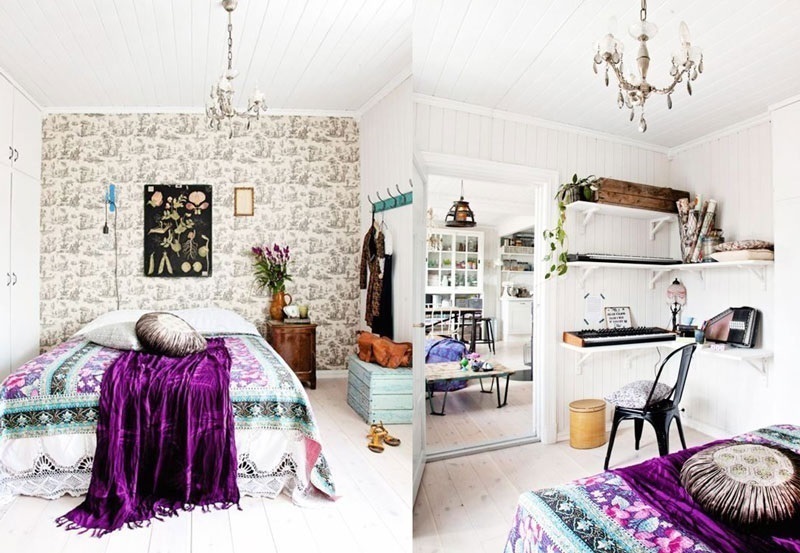 Take a look at this apartment with similar funky colors! 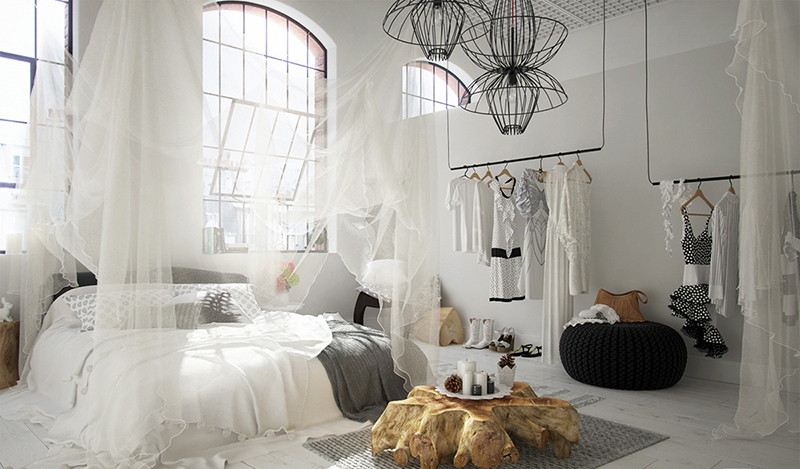 This room is a combination of clean modern lines and exciting, exotic beddings and decor. 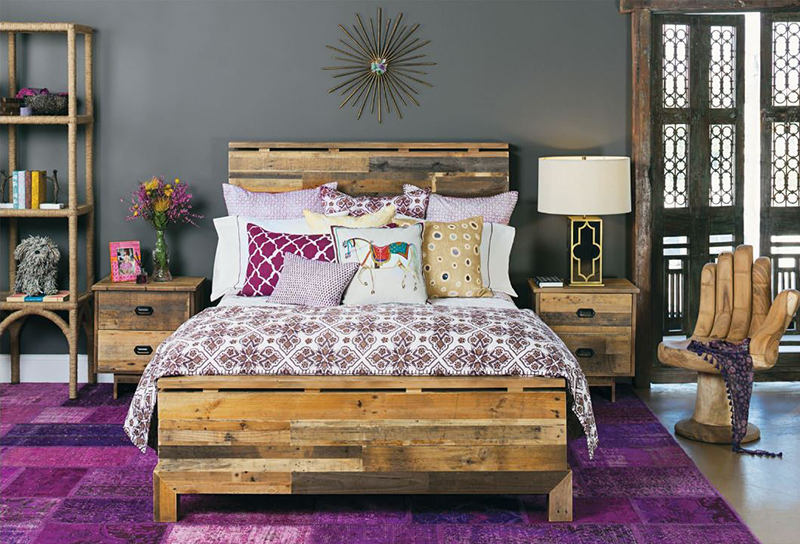 The vibrant carpet blended beautifully with the rustic touch of wooden bedroom furniture. This bedroom is so diverse! Bringing in some greens inside your room can make it feel an instant escape to a tropical place depending on what kind of plant it is. Portraits showing your interests, or photos that tell a story, framed to different sizes can make a playful fill to an empty space on your walls. 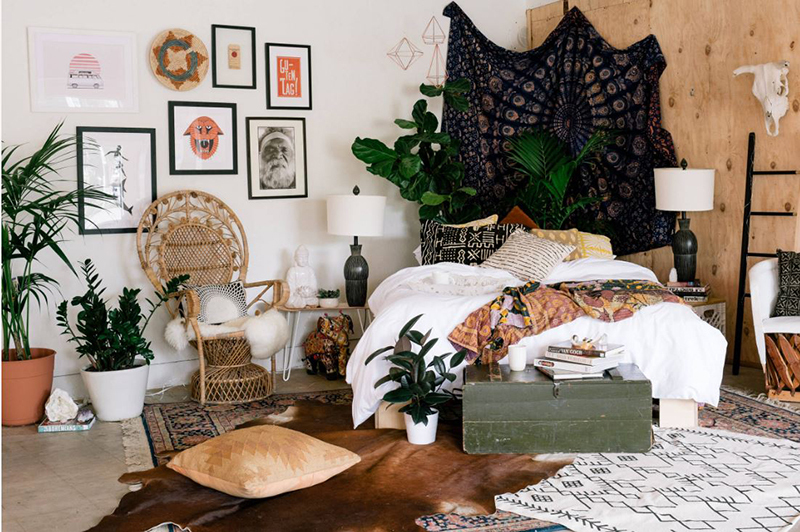 Worldly decor could absolutely add to the bohemian feel in your room. This room is all about diversity. Different patterns and lovely textures make it so appealing and interesting. The pop of lime green creates a lively punch that deviates from the rest of the room’s color scheme. Hope you like the list above. Truth is when I hear of the word “Boho-chic” or “Bohemian style” almost instantaneously I see Esmeralda, a fictional character in Victor Hugo’s 1831 novel The Hunchback of Notre-Dame, dancing gracefully with her flowy dress, barefoot on the street. She perfectly defines Bohemian for me. A gypsy who was not afraid to radiate and embrace her individuality to herself and to anyone else. Who willingly and bravely stands for what she thought was right. After all, that is what Bohemian is all about, individualism, showing your true colors, not minding what other people would say, be comfortable in your own eccentricity. It is more than a style, it is a state of mind.